Pastor Arden Haug began his ministry at Lake of the Isles in January 2013. His colorful and innovative use of music, liturgy and the history of the Lutheran Church has evolved over 25 years of ministry in Minnesota and in Europe. 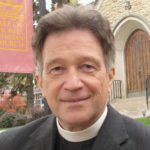 Pastor Haug’s doctoral studies in homiletics or the art of preaching are reflected in his personal, relevant and often humorous and inspiring sermons.